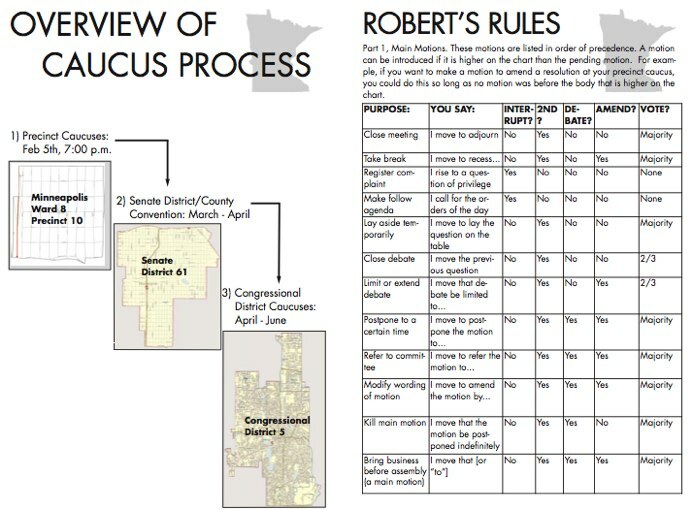 Last night, I felt left out, as I do all nights when Minnesota holds its party caucuses. As usual, my caucus-going pals gave me lengthy accounts of the arcane caucus meeting machinations, and how they manipulated them to silence that ridiculous Rukivina supporter. Listening to them, I feel like a foreigner observing elections in strange, distant, unfamiliar land. But still, I stay home. I did go to a precinct caucus meeting last year for the first time in my life, on account of my Obama man crush. But I left the second after I filled out my scrap of paper. I remember being absolutely elated. On top of the world! Not because I had cast my first enthusiastic vote for President ever. Not because Obama was the most viable African-American candidate in history. Not because of the huge turnout. Not because I had done my civic duty. But because I had escaped that room. The caucus system is disenfranchising. It disenfranchises impatient and busy people who have 15 minutes to give. It disenfranchises people who break out in hives at the mere mention of fundraising, door knocking, phone canvassing or being made to feel guilty for not volunteering for the aforementioned. It disenfranchises people who have an unhealthy obsession with Lost, and don’t have a recording device. It disenfranchises people who aren’t bright enough to do the intricate mathematics entailed in the walking subcaucus vote calculations. It disenfranchises introverts, and others who are more private about their political views, and therefore don’t care to discuss divisive issues like abortion with their neighbors. That’s a lot of disenfranchising. I want to be clear that I have nothing against caucus fans getting their vote. But the caucus system does badly overenfranchise caucus lovers. I’m not naive. I understand that a change in the process will never happen as long as the process is controlled by those who benefit most from it. But a change is badly needed. For the record, here’s what we need. It may sound familiar. Secret ballot. No proselytizing in the polling place. Plurality rules. And best of all, no eye contact necessary. It’s the Minnesota way.